The Builders is a wild ride from start to finish, and it’s my favorite so far of Tor.com’s new series of novellas. It’s a wonderful use of the form, and Daniel Polansky has managed to make a great many parts move like clockwork in a fast-paced, riveting revenge story with a deeply satisfying ending. The best thing, on a technical level, about The Builders is Polansky’s clever use of its short length and the cinematic effect he produces by chopping the story up into short chapters, most only one or two pages long. There’s very little telling here, just showing, and each chapter is like a scene in a movie, painting a compelling picture that moves the story forward. It makes the book compulsively readable, and I could hardly bear to put it down. 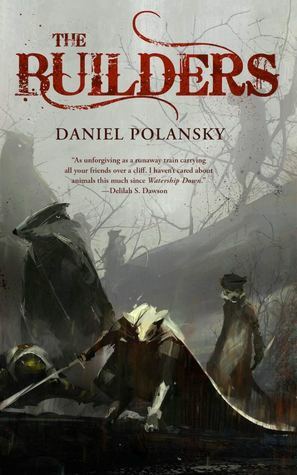 There’s not much about The Builders that is particularly original or groundbreaking, but that is more than made up for by the sheer skill Polansky exhibits by arranging a collection of old tropes and a commonplace plot into a masterfully woven tapestry of a story. It goes to prove that, while there is very little new under the sun in the realm of storytelling, there’s definitely something to be said for doing something that’s been done before—but doing it very, very well. Of course, this isn’t to say that everything about The Builders is expected. Indeed, I’ve never seen this kind of getting the old gang back together for one last revenge quest job story done in quite this way before. You know, with animals. It’s, perhaps surprisingly, pretty great. Cute little forest animals have never been so grimdark, which also makes this the funniest thing I have read this year. ­­­I highly recommend it.